UNARCO’s Push Back Rack rail and cart system are durable with stainless steel cart wheels with heavy-duty bearings for continuous flow. High push back rack cart capacities come from sturdy welded steel construction and can withstand the constant beating from dropping pallet after pallet daily. Push Back Rack carts and rails are manufactured of sturdy components including structural steel, stainless steel wheels and heavy-duty bearings. Push back carts nest within each other for a low profile stack height that leaves more room for vertical pallet height and storage of product. To help drivers visualize the pallet position on the cart, UNARCO can color code the cart system vertical with alternating paint colors. In dense systems this code can help drivers identify the number of pallets within each push back rack lane. Rubber bumpers are located on the inside of the front push back rack system rail to insure a smooth stop as the pallet comes to the picking position. Bumpers help with impact as heavy pallet loads can often cause increased cart speed. Push back lanes are equipped with heavy gauge safety pallet stops. This will ensure that as the cart rolls forward to the aisle picking position, the pallet remains on the push back cart. Pallet stops are easily adjustable as lane pitch changes with the number of pallets deep. 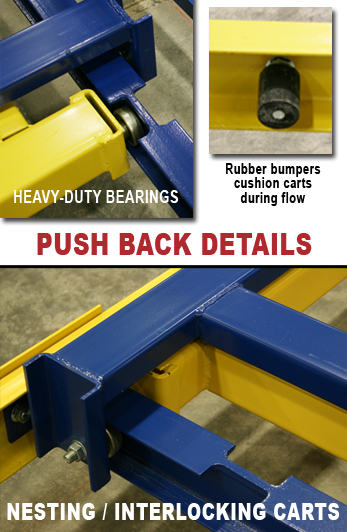 Notched push back rails help protect carts from uplift within the bay during pallet flow. This keeps push back carts linked and helps eliminate product damage or cart derailment. Rail supports are located at center beams to help keep the push back system aligned. The number of rail supports will vary with the depth of the system and weight loads of pallets used. UNARCO push back rack systems combine roll-formed steel with structural steel for the lightest design with the highest pallet load capacity per lane. This efficient engineering keeps cost down while allowing a high-strength system. No company has more push back experience than UNARCO. From warehouse to freezer and even on mezzanines, UNARCO can make an engineered push back system work to improve efficiency in your warehouse. For more photos of push back rack systems view UNARCO Push Back Rack Photo Gallery.